Join our free, private, U.P. wide weather spotters’ email group by entering your email address andpressing the Yahoo button below. About UsUpper Peninsula (U.P.) 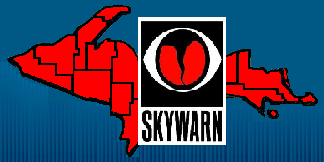 Skywarn is an informal, non-profit group of amateur radio operators, meterologists, and weather spotters dedicated to serving severe weather awareness in 15 counties (Alger, Baraga, Chippewa, Delta, Dickinson, Gogebic, Houghton, Iron, Keweenaw, Luce, Mackinac, Marquette, Menominee, Ontonagon, and Schoolcraft) in northern Michigan. U.P. Skywarn members primarily communicate via their local amateur radio repeater and maintain a private, spam-free, email distribution list called “UPSkywarn.” The purpose of the the email group is to disseminate urgent weather bulletins, organize Skywarn activities in the U.P., and serve as a technical amateur radio and weather discussion forum. Ultimately, this forum serves the public’s interest for weather preparedness and storm reporting to local agencies and the National Weather Service offices in Marquette and Gaylord. Anyone is invited to join our group. There are no annual dues. The webmaster is Mike Swiatkowski, AA9VI. Please send updates, suggestions, and comments to him at aa9vi (at) arrl.net or via the U.P. Skywarn weather spotters’ email group.